BETHLEHEM, PA – Today, representatives of EVS Metal’s East Stroudsburg facility presented a grant in the amount of $3,200 to the National Museum of Industrial History. This grant will go toward the Future Innovators Fund, which offers students much-needed exposure to experiential learning and real-world examples of the historical and ongoing impact STEM innovations have had locally, nationally, and globally. Support from EVS Metal will allow NMIH to waive the costs for up to 400 public school students from Stroudsburg Middle School to visit the Museum in early April. For more information about the Future Innovator’s Fund or the Museum’s educational programming, please contact Megan Pildis, Director of Development at 610-694-6636. Educators interested in applying for consideration of subsidized field trip or outreach program costs can visit http://nmih.org/educate/future-innovators-program/. Attached photo: Check presentation at Stroudsburg Middle School to the National Museum of Industrial History. Credit to: “Glenn Koehler/NMIH”. 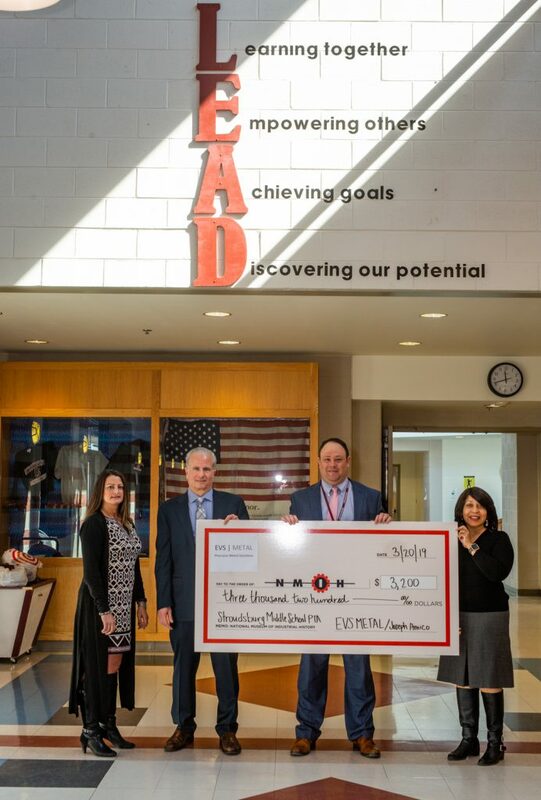 From left to right: Kara Mohsinger, President and CEO of the National Museum of Industrial History; Joe Amico, Vice President of EVS Metal; Jack Schalk, Principal at Stroudsburg Middle School; Michelle Pinnock-Harper, President of the Stroudsburg Middle School PTA. **If you need a full resolution photo please use contact info below. EVS Metal’s mission is to provide custom, quality precision sheet metal fabrications, machining, mechanical assemblies and integration that meet or exceed our customers’ requirements. As the leading sheet metal fabricators in New Jersey, Texas (including Austin, Dallas-Ft. Worth and Houston), Pennsylvania and New Hampshire, their highly-trained experts deliver top-notch customer service and quality outcomes at every level. EVS Metal guarantees that their metal shops will provide products at competitive prices for every order, no matter the size. EVS accomplishes this by fostering an environment that emphasizes personal responsibility, continuous improvement, teamwork, innovation, safety and growth. For more information about EVS Metal, visit evsmetal.com or call 1.888.9EVSMET.